IR does not merely mean to disclose corporate status quo. To figure out the vision of the future, course of action of the company and the issues to overcome, and have investors understand how company is trying to manage these issues and increase the credibility, is the meaning of IR. Above formula shows the investors’ expectation for the future reflects share price. In addition to that, sometimes the investor’s feed-back can inspire seeds of new business strategy. Therefore, it is required to build Plan-Do-Check-Action (PDCA) structure for successful IR. 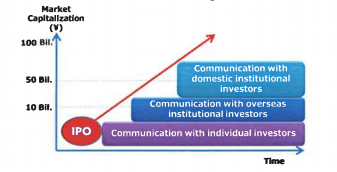 To build up above mentioned IR structure, there are four steps before communicating investors. Corporate vision and mission must be “easy to understand” for vast majority, not only for stakeholders who are familiar to the company. 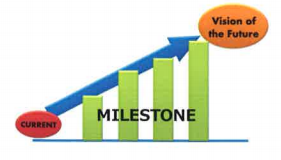 Corporate strategy must be consistent with the corporate mission and must show the “MILESTONE” (Key Performance Indicator; KPI) to be achieved in every fiscal year to reach the vision of the future. Medium term corporate strategy tends to be Profit & Loss Account basis. To supplement the reality of the strategy, capitalization strategy must be constituted on Balance Sheet basis. Further, the precise shareholding situation should be perceived at this stage and accurate communication target should be settled simultaneously. After the completion of these three steps, practical IR strategy will be structured. 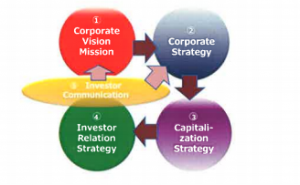 Similar to the corporate strategy, IR strategy consists of medium term strategy and fiscal year strategy with milestones for each year. Each milestone must include IR tool related subjects together with knowledge management process, global approach and stuffing.